So, if I don’t ask, I’m able? Show me where the bad hand touched your exhibition thing. Neither a flasher nor a pervert be. Actually, nothing comes to hand, let alone mind. 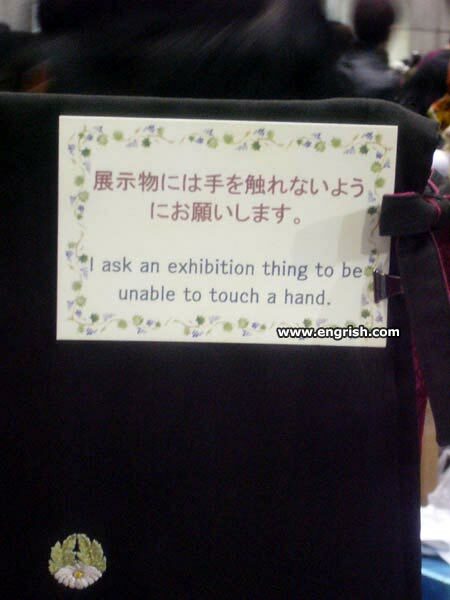 – Excuse me, exhibition thing, could you please be unable to touch a hand? – You stupid human thing, don’t you see I’m an object?! Apparently, it’s just like tennis. Forehand, backhand, Forehand, backhand, Forehand, backhand, Forehand, backhand, juice. @Yu No Hoo | 4:09 am: I sense mischief afoot! Can I ask an exhibition thing to pull my finger? Upgrade plans for Tesla’s autopilot? Oh I don’t plan to miss, chief. I never could understand Yoko’s poetry. One of the girls schools in Brissie a few years ago had a weekend flasher. As you can imagine, on Sunday arvo things are a bit quiet for the boarders. So. The girls were there with score cards like the High-divng. I imagine, that if he only ones and twos, it would do the opposite of encouraging him. Definition: A collection of exhibition things is called an EXPOse! OK, I think I’ve waited long enough to go ahead and ruin the fun. But, you folks already knew that. Leading right to my oft repeated “just pay a gaijin $50 to translate accurately, ya Islander cheapskates” argument. BTW. Conversely….I am too cheap, to pay a nip to translate that for me. 以降のご招待 sounds more like “an invitation for later”, rather than “I invite you to the beyond”, which I think is where you were aiming.